Why is the New Hyundai Veloster a Good Buy for Bellevue Families? A coupe is one of the most popular types of vehicles on the road today thanks to state-of-the-art technology and performance features. That is why we here at Todd Archer Hyundai are so excited to announce the arrival of the brand new 2018 Hyundai Veloster. 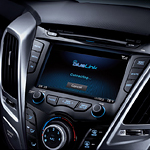 This vehicle has an available 8-inch touchscreen where all things can be controlled, ranging from the sound system to the climate control of the car. This coupe also includes wireless car charging for cell phones. This means that drivers will no longer need to struggle with cords and charging adapters while they're trying to focus on keeping their eyes on the road. If you would like to test drive one of our new 2018 Hyundai Veloster to see all of these incredible features for yourself, then feel free to stop on by and see us today!